Abstract: More than ever, new doctors encounter anatomy in their day-to-day practice during clinical examination and, now, through a relentless increase in demand for modern medical imaging. New doctors are now expected be as familiar with radiological anatomy as they are with the more ‘traditional’ surface anatomy (So et al, 2017). Indeed, there are now calls for radiological anatomy to rise to half of the total curricular time across a contemporary undergraduate programme. 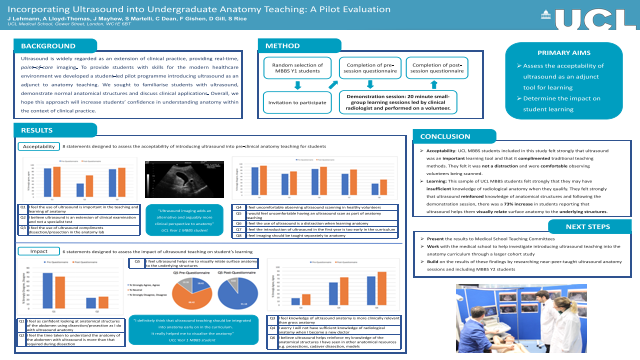 As a group of learners and teachers working together, we undertook an innovative student-led project introducing ultrasound as an adjunct to anatomical learning early in the undergraduate medical programme. This study involved 9 structured 20-minute small-group learning sessions led by a clinical radiologist with randomly selected year 1 medical students during scheduled year 1 anatomy lab sessions. Following ethical approval, volunteers were pre-screened according to our healthy volunteer protocol. Standardised sessions included an introduction to the technique of ultrasound and demonstration of key abdominal structures on the volunteer. Existing knowledge of the principles and basic techniques of ultrasound, as well as confidence in identifying ultrasonic anatomical structures is assessed with a questionnaire incorporating Likert-scale data. Effectiveness and acceptability of the intervention is assessed with a repeat questionnaire after the structured sessions. This pilot study enables us to ascertain the feasibility of this educational intervention, as well as its effectiveness in improving students’ knowledge of anatomical structures. The improvement in anatomical knowledge after the use of ultrasound has been mostly positive, but not unanimously so.